Stillness Manor and Spa is one of the few authentic Cape Dutch houses of South Africa and is located in the beautiful Constantia Valley in Cape Town. 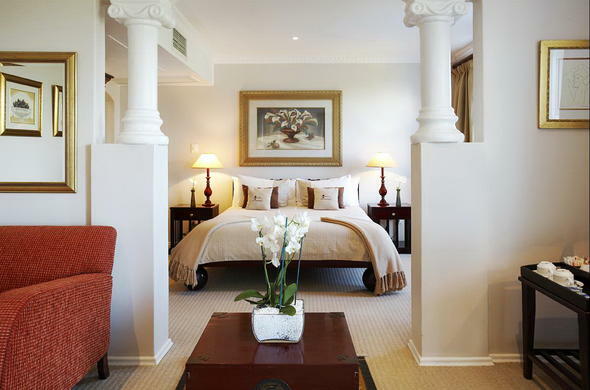 Constantia accommodation is available in one of 10 spacious suites, including a presidential suite in the main Manor House or guests can stay in one of the cottage suites that are tucked away in the Manor’s gardens. The suites of this Constantia hotel in Cape Town are all furnished in rich fabrics and muted colours to provide a fresh contrast with the greenery outside of the window. All of the suites are spacious and have alarms, radios, CD players, mini bars and tea and coffee making facilities.